The public attacks escalated and tax officials fined Dogan €2.3bn – more than the value of the group’s market capitalisation. The fine was condemned by governments and press advocates around the world as political retribution. Aydin Dogan resigned. There was talk that Erdogan was becoming the “Vladimir Putin” of Turkey. “He took it very personally,” says Hanzade Dogan, the elegant 36-year-old vice-chairwoman of the Dogan Newspaper Group and Aydin’s daughter, speaking to Monocle in her spacious corporate office in an unnaturally quiet corner of Istanbul. The prime minister’s growing confidence and forceful approach to the media is encouraged by his huge electoral support and dominance of Turkish party politics. “Today there is too much concentration of executive power which makes it difficult for the Turkish media to speak as freely as they would like,” Dogan says. While there is still fear of angering the prime minister – especially at Dogan’s papers, for commercial reasons – observers say there is little “chilling effect” on ­expression overall. At the time of going to press, the Dogan Group was still waiting for the court to decide on their legal request to strike down the tax penalty. There was no deadline set. “It will be a painful couple of years for us but we are confident that we will win the court cases,” says Dogan. She explains that they are in talks to sell some assets, but “the reason is not directly related to the tax case”. Or perhaps the government has already won. This dynamic country of 77 million people is gaining confidence and becoming a regional power. 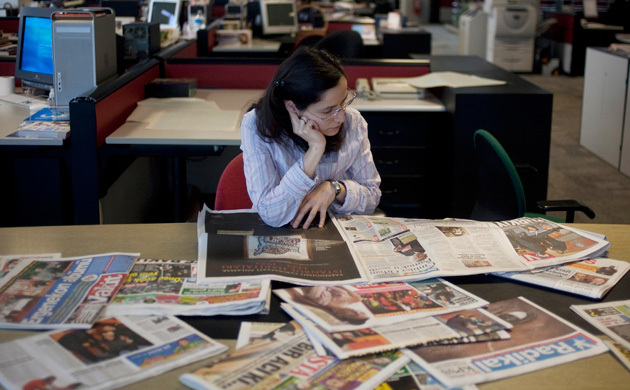 Turkey’s vibrant newspapers are playing a key role in the transformation. Informing much of the non-internet savvy public, they provide a counterweight to political power as well as common topics of political discussion for the men in tea houses across the country. Cartoonists also enjoy a revered place in the Turkish media, largely because only they are able to criticise the powers-that-be so remorselessly. “We’re like the court jester who has the right to say whatever comes to mind,” says Bahadir Baruter, 47, a cartoonist and editor and owner of the weekly cartoon magazine Penguen. Even so, he has still faced 12 court cases for his cartoons, nine of which are still in the courts. The most serious case, he says, was against his colleague Musa Kart for drawing the prime minister’s face on the body of a cat tangled in yarn. To show support, the other cartoonists drew a zoo-full of animals with Erdogan’s face.”I drew him as a cow,” says Baruter. “I was prosecuted for that, too.” The cartoonists were acquitted and the controversy boosted his circulation by 20 per cent, so it’s not exactly clear who had the last laugh. 01 Zaman (Time) 806,005. Owned by supporters of the Islamic movement of Fethullah Gulen. Dogan Media Group: Turkey’s largest media group. Its six title comprise about 30 per cent of the country’s total newspaper circulation: Hürriyet, Miliyet, Posta, Fanatik, Radikal and Referans. It also owns 28 magazines and three television channels. DMG is part of Dogan Holding, one of the three largest conglomerates in Turkey, with over 20,000 employees and active in 13 countries in energy distribution, industry, trade and tourism. Founder Aydin Dogan, stepped down on 31 December; a move seen as a capitulation to the government as in the same week, the editor-in-chief of Hürriyet also stepped down after 20 years. Calik Group: Despite Dogan wanting to buy the second-biggest media conglomerate in 2008, Sabah ATV, the prize went to the Calik Group, headed by Ahmet Calik. He paid $1.1bn. The deal was controversial: Calk is a close associate of the PM, and around two-thirds of the money was loaned by two state-owned banks. Another $125m came from a Qatari company – The Economist reported that Erdogan was said to have lobbied the emir of Qatar personally. The CEO of Calik Holding is Berat Albayrak, the premier’s son-in-law. Turkuvaz Group, the media arm of Calik, also owns 25 magazines and the newspapers Fotomac, Takvim, Yeni Asir, and Sabah and ATV television. Calik Holding also works in energy, textiles, construction, finance and telecoms.